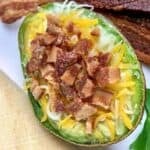 Bacon, egg, and cheese avocados, as I like to call them, are a quick and easy breakfast or snack. 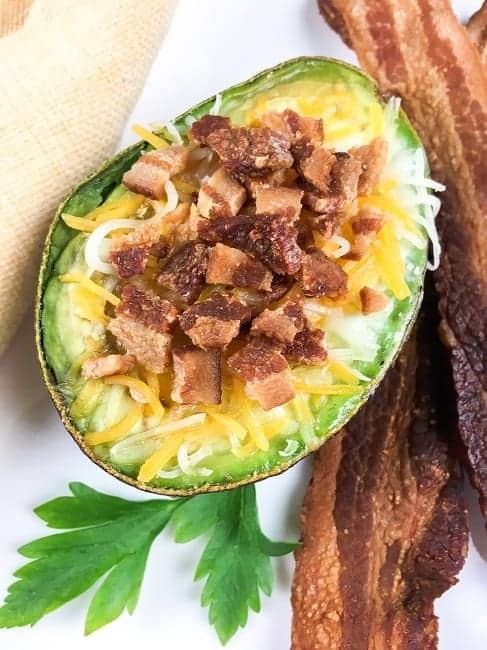 You don’t have to be on a low carb or keto lifestyle to enjoy a stuffed avocado. According to an article from verywellfit.com, “…avocados also deliver vitamins E and C, potassium, folate, and fiber. And it contains plant sterols that may help reduce the risk for cancer, as well as the antioxidant lutein, which helps keep your eyes healthy. Numerous studies show that avocados can help reduce cholesterol levels, improve heart health, and aid in weight management.” Read this article for more nutritional information and avocado benefits. Besides the obvious, guacamole, we love to eat an avocado half (seed removed!) filled with a little Italian Dressing or Balsamic Dressing. I learned this from my grandmother. Add avocado to your favorite smoothie. A simple avocado salad with tomatoes and cucumber is very good. An avocado egg omelet is scrumptious. And who doesn’t love a tuna salad stuffed avocado! I love avocados so much, I’m attempting to grow an avocado tree from the seed. Wish me luck! 1. Cut avocadoes in half and remove the seeds. Carefully remove some of the avocado flesh to make room for the egg. Use small or medium size eggs since large eggs tend to overflow. 2. Place the avocado halves in a muffin tip to help keep them from moving around. Crack an egg into each avocado half. Sprinkle a little salt & pepper to each avocado, if desired. 3. Bake for about 20 minutes at 350F. Remove from oven and top with cheese and bacon! I have found the best way to keep a perfectly ripe avocado fresh and prevent it from turning brown is to place it into a sealable plastic bag and refrigerate it. Don’t place an unripe avocado in a plastic bag as it will never get soft. 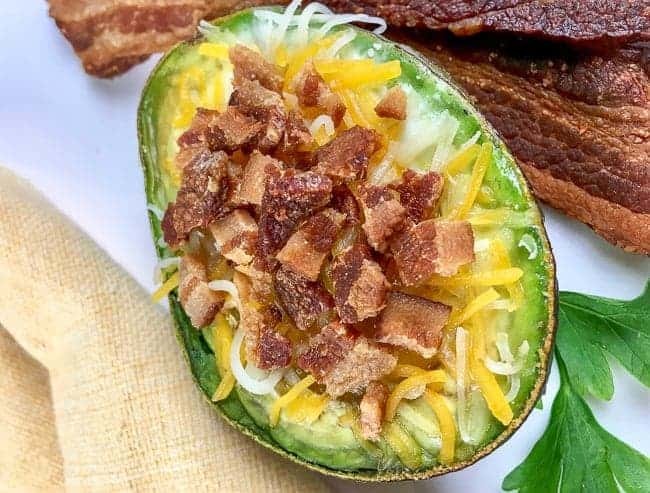 Ripe avocado halves filled with an egg, topped with cheese and bacon, and baked to perfection. Cut avocadoes in half and remove the seeds. Carefully remove some of the avocado flesh to make room for the egg. Use small or medium size eggs since large eggs tend to overflow. Place the avocado halves in a muffin tip to help keep them from moving around. Crack an egg into each avocado half. Sprinkle a little salt & pepper to each avocado, if desired. Bake for about 20 minutes at 350F. Remove from oven and top with cheese and bacon.